I decided to not attend any kind of sale this past weekend, but instead spent my time relaxing, as I know this weekend is going to be crazy hectic. I'll get to that in a minute. Anyways, even though I didn't buy anything, I was still able to acquire some new things. My dad works for the largest power company in Indiana. He manages all of the buildings the company owns south of Indianapolis. Well, in one of his older buildings (built in 1956) they were updating some parts of the building. Knowing these things would end up in the trash, dad saved them for me. 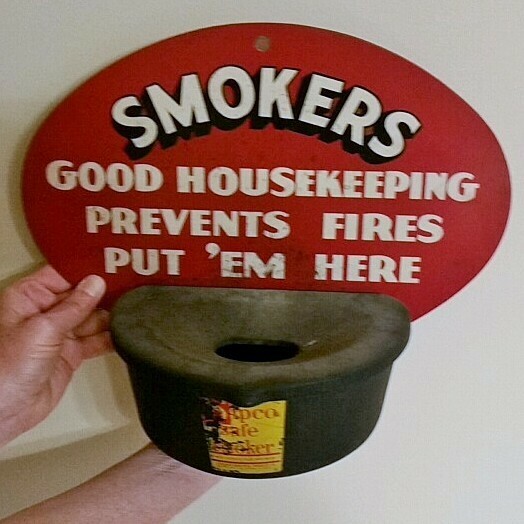 The first thing is a Sipco Safe Smoker. It was original to the building, so it dates to 1956. 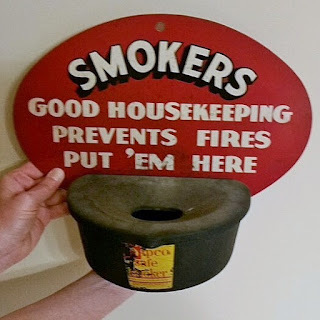 Ya know, back when you can smoke anywhere you wanted. I scoured the depths of the internet and only found ONE that sold at an online auction years ago (no, it wasn't ebay)! Knowing what that one went for, I'm thinking this one is valued around $150-$200. Dad wants me to sell it to help pay for parts of the wedding, which I'm obvious okay with. 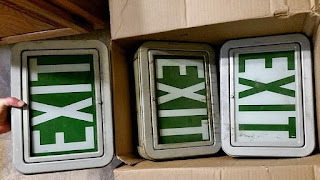 These GLASS exit signs were also taken down (even though they still worked) to be replaced with newer models. Dad said his records indicate that these were put in during the 1960s. Dad and I put our heads together and decided that we (ahem, HE) will wire a lamp cord with an on/off switch to it, so that they can be used as a cool lamp. After coming up with this idea, I browsed etsy to find that a few other people had done this also. Most of them were newer plastic ones. The older ones were fetching $100-$200, even without being rewired. When I went to pick them up yesterday, unfortunately the white one had been bumped, or something, as the glass was broken. MAJOR bummer. Again, more things to help cover some wedding costs. It's not major bucks, but every little bit helps! Okay, so anyways, I bet you're wondering why I had to relax so much this past weekend, right? Well, I'll be attempting the World's Longest Garage Sale for the first time! So, I've been working hard to plan out a route, which I'm going to share with you. If any of you have ever done any portion of the route I've planned, please let me know how it was, how long it took you, etc. Trying to make the most of my time! I'll be starting just north of Cincinnati and drive til I hit my campsite that I booked in Celina, Ohio on Grand Lake. I haven't camped in a tent in years, so I'm actually looking forward to it. Friday I hope to make it to the "beginning" of the route in Addison, MI. I'll head home Friday night to unload and pick up my mom. 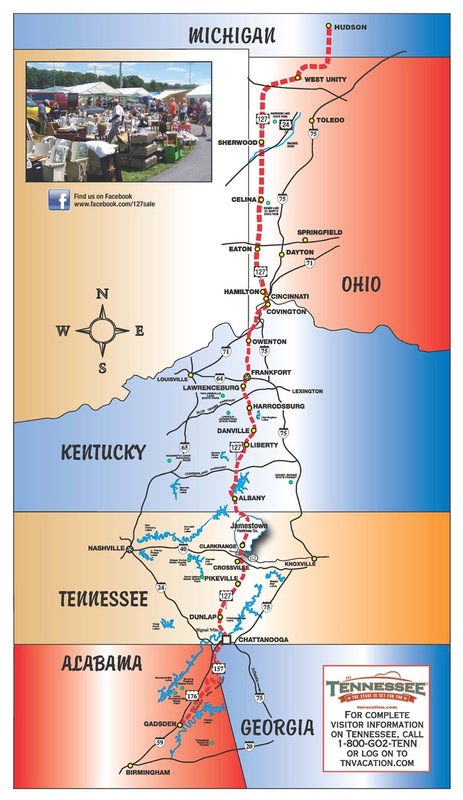 We will be starting on the south side of Cincinnati (Florence, KY) and getting as far as we can into Kentucky. I'm think we can make it to Frankfort. Alright, so you seasoned 127 veterans out there, I want to hear from you! 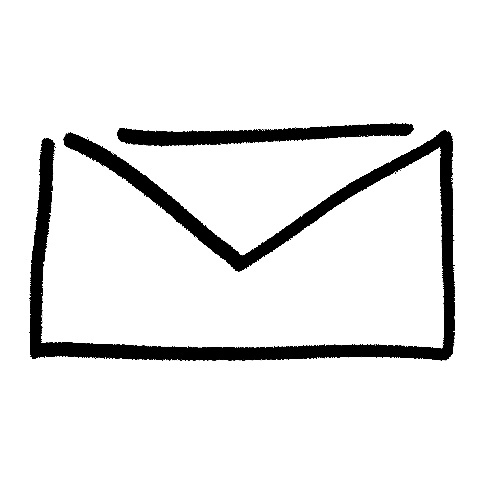 Drop me a line in the comments below or send me an email (click the white envelope off to the right side). Your dad found some great industrial pieces. Good luck driving down the sale route and be safe. Remember to share your treasures. Thanks for sharing at mu party this week. Darn...I will be shopping the sales in Alabama and Tenn. Hope we both find a lot of treasures. Cool finds at your home base! I have always wanted to do that garage sale since I saw it on HGTV!!! Have fun and take a big van or U-Haul trailer! Love the great finds from you dad! Can't wait to see what you get at the worlds largest yard sale! Your dad brought you some awesome stuff! 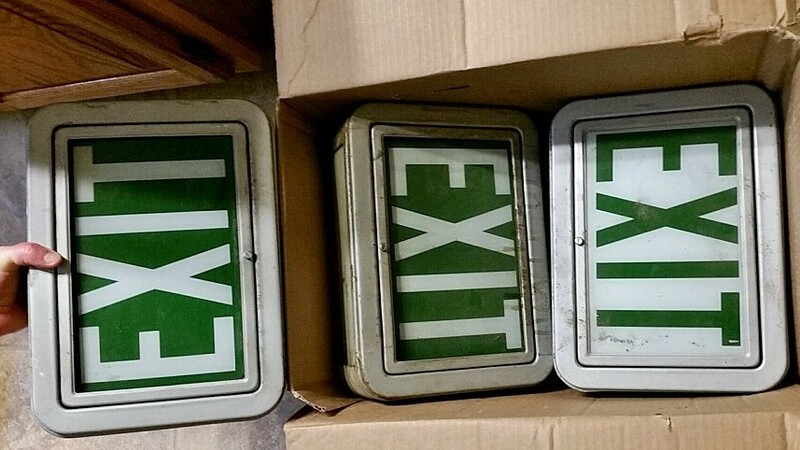 I love the idea of the Exit signs being lamps. Have fun at the world's longest garage sale. I know you will come back with amazing stuff to show us! This is our second year. We shopped Alabama yesterday, which was awesome, and are going to Tennessee and Kentucky tomorrow. It is so much fun and there are lots of great deals. Wow, love the cool salvaged pieces your dad brought you. Hope you're having a great time on your World's Longest Garage Sale adventure. Thanks for sharing with VIP.